Evening temperatures in the northern reaches of the Northern Hemisphere – like here in the UK, for instance – aren’t especially suitable for sitting outdoors while enjoying a post-nosh chinwag round the table. Once the sun sets, the temperature plummets and everyone’s either reaching for the cardigan or heading back indoors again. But it doesn’t have to be that way. You could, instead, warm the cockles round a roaring fire pit, just the way our hairy simian forebears intended. No longer are fires just for scaring off sabre-tooths and making mammoth kebabs a bit more palatable — in the form of a striking fire pit, they can be beautiful, functional, sociable pieces of art for enjoyable outdoor living. Plus, they can toast a mean marshmallow. 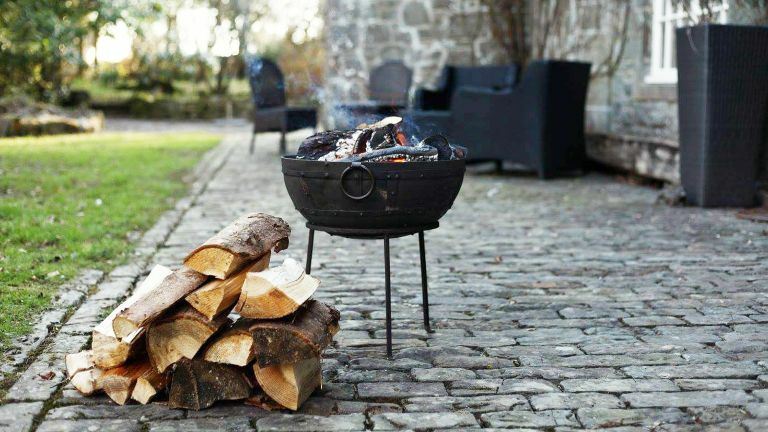 Whether you want it for flipping burgers at your next barbecue or perhaps even thawing out chilly extremities on Guy Fawkes Night (creepy effigy optional), the right fire pit is a joy to have in any garden. But how do you find it? Fire pit models featuring grills or heating plates for alfresco cooking mean you’ll be hard-pressed for an excuse to go inside at all, and anything that keeps the festivities going longer gets a thumbs-up from us. Alternatively, simply opt for a bogstandard model without a grill and do your cooking on a proper charcoal or gas barbecue while the fire pit blazes away near the dining area. A third, much cheaper method is to load your kettle barbecue with wood after you’ve used it for cooking. However, this isn’t as efficient as a bona fide fire pit because most kettle BBQs are waist height, meaning the heat won’t radiate quite as well, especially if you’re lounging about on low chairs. Think about your other needs: if it’s design kudos you’re after, go for a good-looking model with a durable finish that’ll stay smart year after year; if your fire pit’s staying out year-round as a permanent fixture, look for long-lasting materials and an included cover to ward off the worst of the weather. And if your crew are keen campers, look for a portable fire pit that you can take on the road. For a cosy home-from-home atmosphere wherever you go, just be sure to get one with legs or a stand that’ll avoid scorching the grass. A final consideration is fuel. The bigger the fire pit, the more logs you’ll need to add to keep it going. If you live in the countryside and have access to an infinite supply of logs then you’re in luck. But if you’re an urbanite, it’s going to cost you about £5 for a bag of local garage-sourced fire logs and a bag full will burn away in next to no time. For a large fire pit like the Dancook 9000, three hours of alfresco entertainment could easily amount to three or four bags of wood. That’s up to 20 quid’s worth of cosy entertainment; the price of three extra bottles of plonk. If you’re considering investing in one of these outdoor features, you’ve come to the right place. We’ve narrowed it down to the top 10 best fire pits on the market right now that cater to a range of lifestyles, budgets and environments. A lot of fire pits double as barbecue grills. Take this wide, stainless steel bowl of classy Danish minimalism for starters. The Dancook 9000 is 76cm wide – that’s big – and comes with a 53cm, heavyweight stainless steel grill meaning you could start an alfresco evening with a handful of charcoal to cook some sausages, chicken legs and kebabs and then, post grub, remove the grill and throw a pile of logs on top of the charcoal for a blazing fire. The 50cm-high stand’s a clever design too: not only does it look great but it also lets you store the steel bowl on its side so it doesn’t fill with rain water and become a mecca for mozzie lava and other unsightly natural things. Astoundingly, the Dancook’s surrounding three-inch lip remains merely warm to the touch and not searingly hot as you might reasonably expect, given that the whole thing is shaped out of heat-conducting steel. This means that kids and pets won’t get burned if they inadvertently brush by or touch the outer edge. A top, very keenly priced but sophisticated modern-art option, but only for those with more capacious patios. Lightweight and foldable for handy transportation, with classic good looks, and doing double duty as a fire pit and BBQ, the Outwell Cazal Fire Pit makes the perfect camping companion. Despite being raised, it’s been noted that this fire pit can cause some damage when placed on grass, so stick to placing it on a patio – alternatively, putting it on bricks will help. At the bargain price of just £40, it remains one of the best fire pits for home and away. What's a bit of singeing between friends? We love the Fallen Fruits Iron Woodland Scene Fire Pit for its decorative style. This rustic fire bowl has been intricately designed to bring your garden to life with woodland silhouettes and earthy tones. This fire bowl is for use with logs, which makes a unique and stunning centrepiece for your garden, however the cut out shapes can cause ash to blow out of the bowl, so be careful not to overfill it. The Chic Bio Ethanol Fireplace is small and lightweight, allowing you to create style and ambience wherever it’s needed. Because this product burns fuel it doesn’t emit smoke or soot, making it one of the best fire pits for indoor and outdoor use. The modern and stylish glass panels make it safe to burn anywhere, but while it does give out some warmth, it’s definitely designed for decoration rather than for heating or cooking. As a budget fire pit that looks deceptively expensive, though, it’s ideal. Kadai Firebowls produces a wide range of Medieval-looking fire pits, some of them over 100 years old and costing upwards of £400 apiece– no, we’re not the first generation to think about filling a bucket with a bunch of logs. This particular model isn’t 100 years old but it certainly looks it. Thankfully it’s a lot cheaper, too. To the untrained eye, the Travel Kadai looks like an inverted Norman helmet and it’s probably just as tough. It measures 45cm across so is just the right size for a small patio and perfect as a campfire. The short stand adds a little extra elevation. This model is also equipped with a grill and a pair of tongs for those au fait with the lid-less direct cooking technique; ie keeping a constant eye on the food and regularly moving it around so it doesn’t burn. It also comes with a handy carry bag. Incidentally, Kadai recommends using 8cm of sand in the bowl to help keep it in tip-top shape; the norm with some fire pits. If you love the ancient, reclaimed look then this one’s well worth adding to the list. The hand-crafted design and rust-proof copper of the CobraCO Vintage Copper Fire Pit make it a great choice for log-burning all year round, as well as providing a handsome rustic finish. The fire bowl comes complete with a heavy-duty screen cover to keep sparks contained, and a vinyl protective cover to keep it in good condition when not in use. Although the manufacturers list it as portable, we personally find it a bit weighty for lugging to the campsite, but we love it as a permanent feature for the garden. The Fuoco Tabletop Fire Pit is a must-have for campers, hikers and festival-goers alike. By far one of the best portable fire pits, it’s compact and easy to transport, and it comes handily equipped with a long-handled extinguisher, so you can safely and easily put out your fire wherever you are. This modern fire pit uses burning gel, which burns quickly and can quickly become costly as a result, but if you’re using it purely for trips or events then it’s an undeniably handy piece of kit. While it’s admittedly huge and outrageously heavy, its weatherproof cover means you don’t have to worry about moving it during the colder months, so it can remain a permanent fixture — good news for our backs. We’ve already found the must-have garden item for next summer, and it’s Outsunny’s versatile 3 in 1 Fire Pit. It burns all types of fuel, and doubles up as a BBQ and outdoor dining table, making it the perfect accessory for toasting marshmallows, keeping food warm and outdoor dining. It also features a mesh cover and heat-resistant surface for added safety kudos. It’s a bit too cumbersome to take camping, but it will wait happily in the garden for sunny weekends with the family. This giant Kiln Dried Swedish Candle is a great novelty item, and although it’s more for show than anything else, it makes a fun addition to garden parties and other events. This twist on a conventional fire pit can be used to toast treats or to cook with a frying pan, but doesn’t produce as much heat as some of the larger fire pits — it burns from the inside out with just a flickering of flame at the top, so it’s less daring than it looks. It’s deceptively heavy for its size (don’t even try to take it camping), but it’s an undeniably unique centrepiece.